From 62 to 70 € the night I book ! 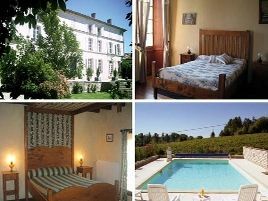 Once through the typical Charentais archway, you will find an authentic 1850s mansion, with architecture typical of the region, set in lovely grounds with swimming pool. Comfortable rooms, furnished individually with antiques, each with views of the surrounding countryside and vineyards. Breakfast is served in the dining room with its interesting sideboard or on the terrace, weather permitting. Visits of the old distillery and the exhibition of old work tools possible. Warm, ready welcome. A great address at reasonable rates!. - une bonne halte pour découvrir le vignoble du Cognac et des Charentes. - possibilité de découvrir le paysage en traction Citroën®. - pêche dans la Charente à 3 km. - golf de Cognac Saint-Brice à 25 km. 4 rooms with shower and WC. 45 euros (1 pers. ), 60 euros (2 pers. ), 70 euros (3 pers. ), 80 euros (4 pers.). 2 gîtes also for rent. Baby equipment, babysitting, games. Large family room. The closest station is Châteauneuf-sur-Charente, located at 12 km. The closest airport is Bordeaux , to 100 km.